Kirbyson was interviewing Asper as he would have for a story in his news organization’s website and paper, but the cafe environment created a different environment, allowing for the community to watch a journalist in action and take part in the discourse. “I usually start events like this by saying ‘How many of you came for something to eat? Well, you’re in luck – you’re getting dinner, and a show!’,” Lett said in an interview. 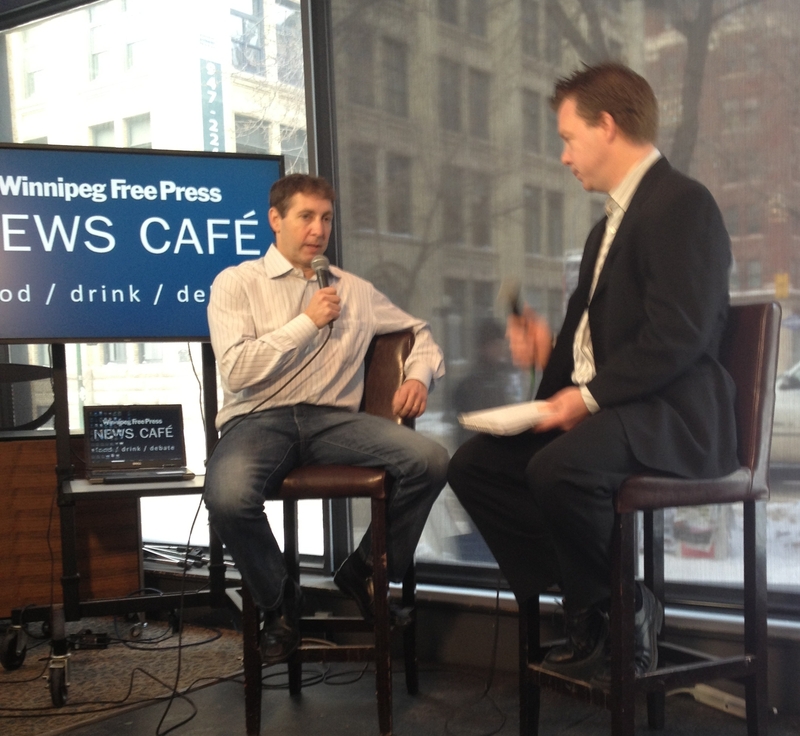 The concept for the Free Press’ News Cafe was conceived in the fall of 2010. Originally the plan was for a small satellite newsroom in a cafe setting. Web video resources were relocated, the Cafe opened in March 2011. “It was supposed to be a kind of casual thing where people could come see journalists at work,” Lett explained. “The thing is, there is very little that journalists do that is dynamic and interesting to watch. And not everyone can do journalism in a busy restaurant. It’s difficult to carry on phone interviews. And let’s be honest, it’s not all that entertaining,” he said. There began a series of experiments to see what would draw people into the cafe. Lett and his team held online open forums with journalists, which morphed into panels and symposia. Luckily, 2011 was a big election year with federal, provincial and local government votes. The News Cafe started doing a lot of programming around elections. “There are some people who think that elections are an event, with nachos and beer,” Lett said. On the night of the U.S. election in November, there were more than 100 people at the News Cafe, most in the crowd were university and college students. The News Cafe held more than 100 events in the last quarter of 2012, which brought in more than 2,500 people. “The hard part is convincing people in the industry that there’s a need to promote the brand. We’ve never had to do that before,” Lett said. Leonard Asper, left, relaxed as he answers questions about his company’s bankruptcy. One of the beautiful things about the cafe is not only that it allows the public to see how journalists work, it gives them access to politicians, celebrities, artists and other people they might not ever have an opportunity to meet. The less formal setting also puts interviewees at ease, Lett said. As an example, he pointed to an interview he did at the News Cafe with Federal Finance Minister Jim Flaherty. Lett was struck by how silent the cafe had fallen, as the audience listened to what Flaherty had to say. He commented on it during the interview. “Well they have to listen, or I’ll just raise their taxes,” Flaherty quipped. That kind of comment would never have been made in a more formal setting. “The simple beauty of this operation is that it works best when it’s a conversation. It’s supposed to be interesting and engaging,” explained Tyler Walsh, the News Cafe’s Multimedia Editor. It’s also a platform that allows for more playfulness. It’s a subject that probably wouldn’t have found itself in the pages of the Free Press, Lett said. This can blur the lines with traditional competitors. The day after the Flaherty interview, Lett and the finance minister were splashed across the cover of the Metro. 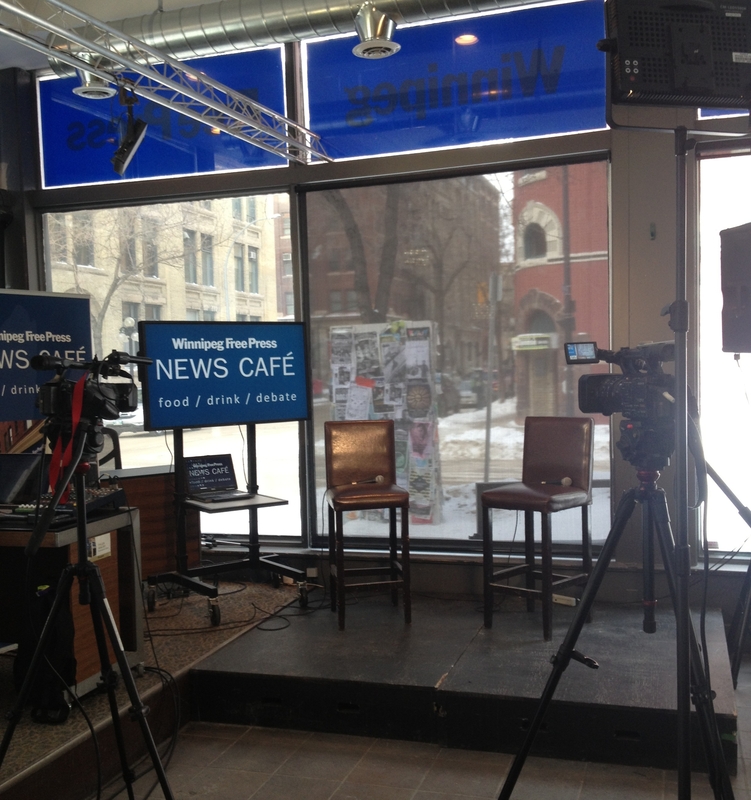 The News Cafe is located in Winnipeg’s historic west exchange district downtown, home to a large concentration of Chicago-style architecture – and far from the industrial ‘Inkster Park’ that is home to the Winnipeg Free Press. While it’s still an emerging area, it was once known as newspaper row. Being a news hub isn’t something new for the space. Recently, Lett discovered that the cafe is located in what was once the dining room and bar of the Mariaggi Hotel. During the Winnipeg General Strike, reporters filed from the same spot where Lett and his team performs its random acts of journalism. News still breaks at the building. Reporters write stories off of their interviews. Manitoba Premier Greg Selinger is often interviewed at News Cafe. Recently, Selinger told Lett before they went live that he’d be making two announcements on air. 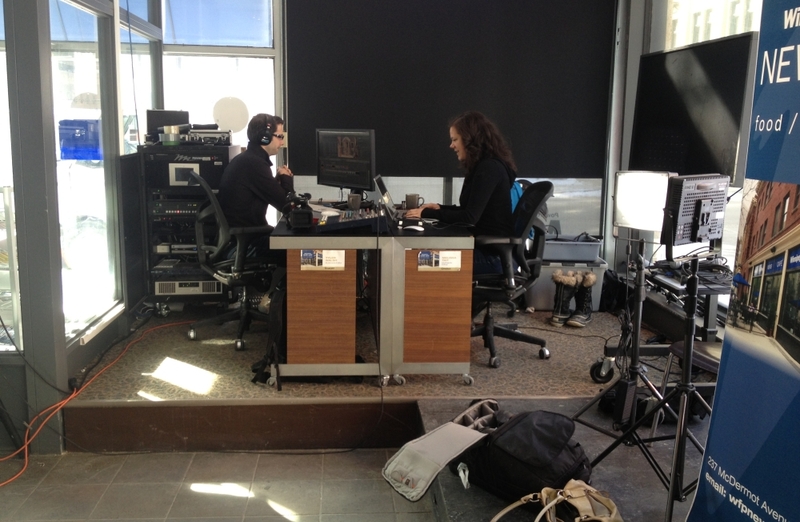 Walsh and Tait at their News Cafe workspace. When there’s a big newsmaker coming to the cafe, Walsh acts as show producer, and edits video for replay. He works full-time at the News Cafe, with photographer and videographer Melissa Tait. 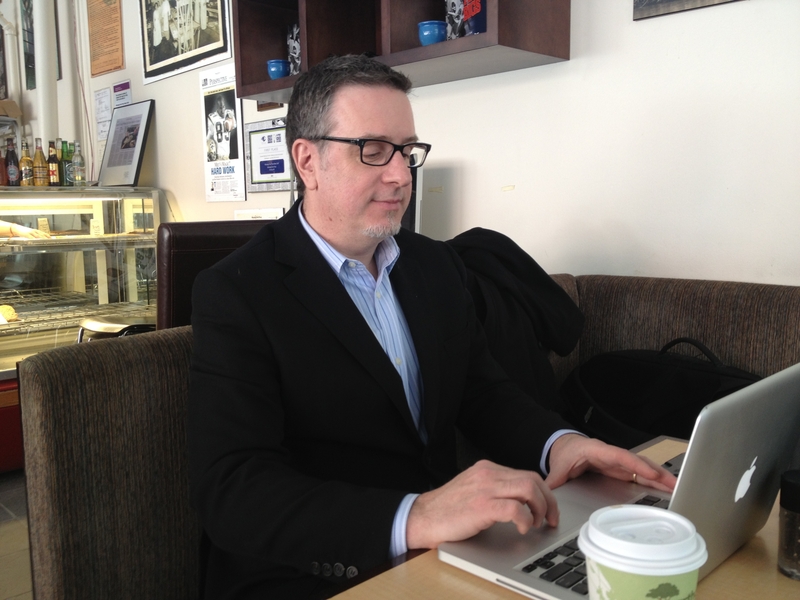 Walsh and Tait are Winnipeg Free employees and members of its guild, they just work out of the News Cafe, Lett explained. The News Cafe is not a cost centre, Lett said, and because it makes things easier logistically, it actually saves money. The cost to run the News Cafe is minimal, thanks to some strategic partnerships. The News Cafe was set up through a leasehold improvement agreement. 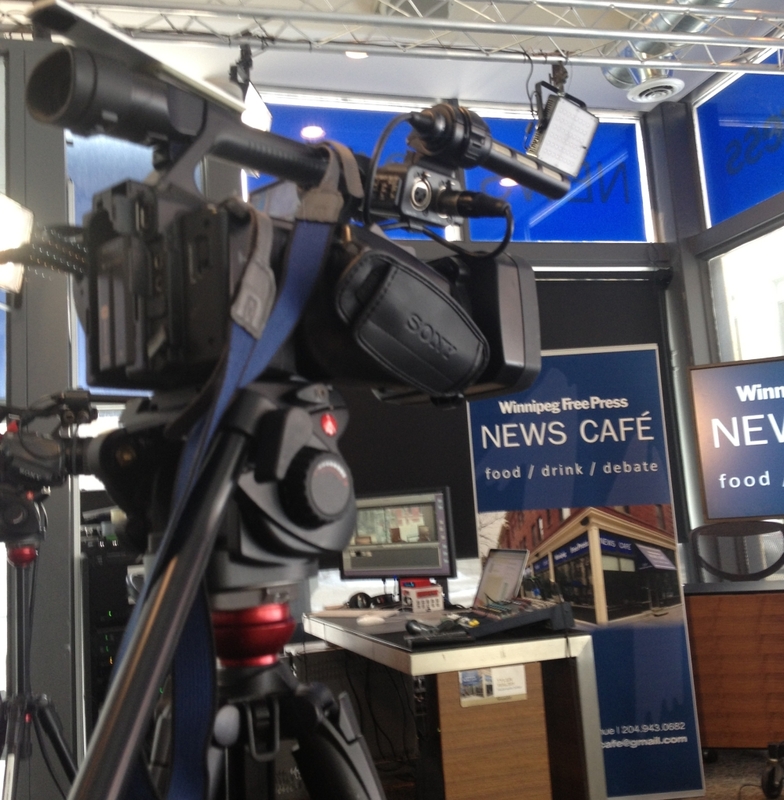 The Free Press gutted and rebuilt the cafe, and moved in all the equipment it needed to webcast. It doesn’t pay rent. “Basically we just relocated people from office,” Lett said. 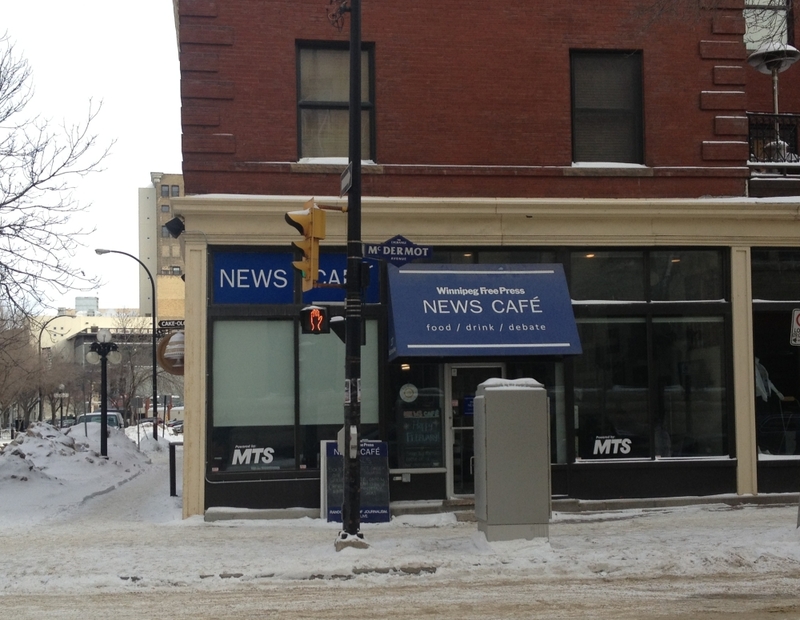 The News Cafe has a sponsorship agreement with Manitoba Telecom (Signage on the windows indicates the News Cafe is ‘Powered by MTS’), which means it has no phone, internet, or television costs. The restaurant is a separate partnership, which is independently managed outside of the Free Press, which exists formally as a non-equity shareholder. Any profits from coffee, breakfasts, soups and sandwiches (a pretty tasty menu, fwiw) go to the restaurateur. While the space wouldn’t feel the same without food and beverage there, it doesn’t make sense for the news organization to try to make money off a restaurant, Lett said. “Newspapers don’t know how to run restaurants,” Lett said, and took a bite of his breakfast. “The Free Press is not trying to make money selling sandwiches and soup. While the news cafe is primarily for audience engagement, Lett said it has had held a handful of events and projects that allowed them to create advertising partnerships. Investment firm PI Financial partnered with the News Cafe to hold a series of financial workshops on investment strategy. When Facebook had its IPO the group came in to talk about how digital companies are trying to monetize. “What a PI Financial event does when they do the event, they buy advertising online and in print to support the event, and in return we’re connecting them to thousands of people,” Lett said. There was a special program with the city’s fringe festival, which provided a small return. Lett said his goal for the News Cafe is to get people engaged, to curate and convene public debate. Last year, the Winnipeg Free Press ran a big series on voter apathy, and found that fewer people are reading the news, fewer people are voting, fewer people donating money. “There’s a compelling argument that it’s all connected,” Lett said. He hopes the News Cafe can help turn that around, that it and the public media project the Community News Commons will get people to care more about the issues in their community. The News Cafe is opening up the debate to new audiences, people who might not pick up a paper, Lett added.